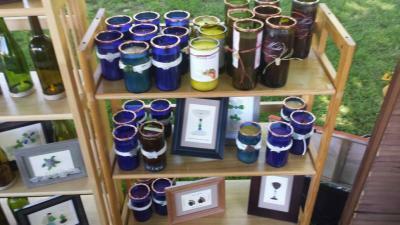 A craft show in North East showcases the hard work and effort of local artists and crafters. As I rode past street signs decorated with images of grapes and buildings with similar decorations, I came up to a bustling park filled with white tents and people meandering, hoping to find some local gems from the Gem City. Well, it took place a little bit outside of Gem City – North East to be exact. Gibson Days, sponsored by the North East Garden Club at Gibson Park, helped to get local businesses from Erie and surrounding areas, such as a few places in New York, to come together and sell items artists have crafted. Because I only heard of the event a few days beforehand and could not find much information online , I thought the festival might just have a couple of tents and a small stage, however took up the entirety of Gibson Park – much bigger than I expected for the minimal amount of advertisement I saw. Many different tents and booths lay scattered about Gibson Park, but none of them gave the indication that I should "start here," so I just began walking near where we parked – about a block away. Stepping into the cool, shaded park felt relieving compared to walking a block in the sun at noon. Before looking into any of the tents, I heard the live music. The advertisement about the event said live music would be provided, but it left out that the music consists of blues, country and children's genres. I was only at the festival for the blues portion of the musical acts, and while most people might not enjoy sitting down and focusing on the music specifically, the music provided some enjoyable background noise while perusing through different merchant tents. It seemed as though the artists and merchants had a demographic slightly older than my age when they were creating these items. As a 21-year-old college student who lives in university apartments, I was uninterested in many of the items I walked by – such as belts, woodwork, and kitchen utensils – but I still found many items that I would buy, and I still appreciated some of the craftsmanship of the things I had no particular affinity to. The beach glass jewelry and other artifacts made from glass found at Lake Erie stood out to me as some of the most interesting items. I also liked the many pieces that incorporated grapes or wine to show some pride for North East – things you probably have a hard time finding at WalMart or Target. Talking to some of the vendors helped me to discover how much work they put into making each and every individual piece in their store. Although I felt unable purchase anything from the shops due to my college kid budget, I took business cards from the places I found intriguing and wished them good luck in their sales. Independent sales representatives also made up a good portion of the festival. These ranged from consultants for makeup products, such as Mary Kay, to scented products, such as Scentsy. Upon talking to some of the sales representatives who spoke to me, they were either moms who needed some extra money to help raise their kids or post-graduates stuck in between jobs. The guy who generously gave me a ride to the festival and walked around with me had some thought-provoking input as well. The jewelry and makeup failed to perk his interest as much as it perked mine, but he stopped by one booth to try a few pieces of fudge, which surprised me with their economic price and in his opinion, tasted better than overpriced fudge at a theme park. He also mentioned at one point that even though he lacked interest for the jewelry or wine bottle candles, he appreciated the hard work and time that someone took to make them. It got me to think that even though some of the products might be more expensive than a superstore or a pharmacy, I know exactly where my money goes –if I were bought anything from that festival if I had the luxury to do so. In terms of local literature, I only found a letter to the editor in the Erie Times-News that discussed that when you donate to a local business or artisan, the money you spend stays in the community and helps to circulate the economy of the community you live in. It's a bit difficult to think about it that way when people live on a budget, but if someone can set finances aside for a second, it appears more beneficial to spend a few more dollars on a locally crafted gem. I took a couple of bucks to participate in the Chinese Auction that the garden club held, because I figured even if I win nothing, I could donate some money to the garden club so that it puts on the event next year. I did win two things – a necklace an earrings set and a gift certificate to Scentsy – which surprised me. Overall, I thoroughly enjoyed Gibson Days and learned more about local vendors. Even though my budget kept me from buying anything, I may use the business cards I picked up to contact some crafters if I ever do decide to buy something.